An Onawa, Iowa man died Saturday night, just days after a propane explosion at his home. 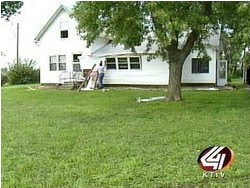 On Tuesday, police say someone robbed this home and stole copper tubing water lines. In the process, the thieves cut the propane line. Later that day, the homeowner, 80 year old Earl Thelander, turned on a fan to vent the fumes and that’s when the explosion happened. Thelander drove himself to the Burgess Medical Center in Onawa, with burns over 40% of his body.